The 20th Anniversary celebrations continue! On sale this weekend until next Friday is the VIII Somua SM . It is an armoured heavy tank that can brave some incoming fire in order to reposition itself. 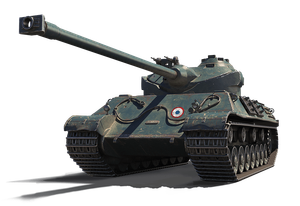 With its high damage potential per drum magazine, long reload time, and its lack of heavy armour protection (compared to other Tier VIII heavy tanks), it is best played as an armoured assassin. Its armour is only enough to give it a chance at bouncing shots; it won't hold up well in sustained frontal combat. This tank shines when ambushing stragglers low on HP, reloading enemies that have long reload times, or enemies that are otherwise occupied fighting your allies. If this is your kind of playstyle, then this is definitely your kind of tank.